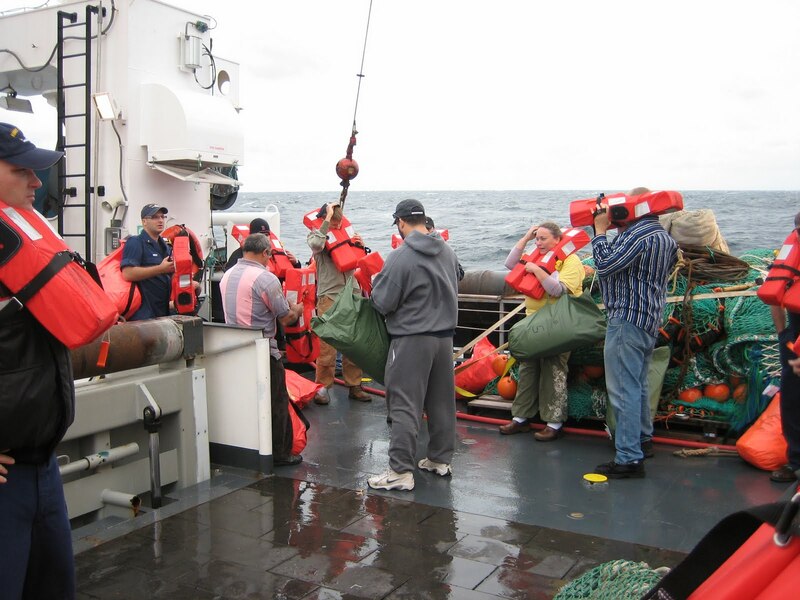 Safety is very important on NOAA Ship Henry B. Bigelow. We participated in a Fire Drill and an Abandon Ship drill today. Each person on board is assigned a location to “muster” (gather) in case of emergencies. For a fire drill, all scientists are to carry their life vest and survival suit and muster in the lounge directly across from my stateroom. Life vests and survival suits are kept in the staterooms, so we are to grab those and get to the lounge as quickly as possible. The fire drill began while the day watch was in the wet lab, one level below my stateroom. The scenario was that there was a “fire” on the 01 deck beside the lounge. That was right where my stateroom and the lounge were! Since we couldn’t get to our staterooms to gather our survival suits and life vests or muster in the lounge, due to the “fire,” we grabbed extra life vests and suits from the wet lab and mustered in the mess hall, which is near the wet lab. Once everyone was accounted for during the fire drill, we moved out to the back deck of the ship for our Abandon Ship drill. Each person on board was assigned a life boat, and that is where we mustered for the Abandon Ship drill. First, we put on our life vests and made sure they were secured tightly. Next, we took off the life vests and put on our survival suits, which are often called “Gumby Suits” because they are large and look a lot like the animated Gumby character from the 1960’s. 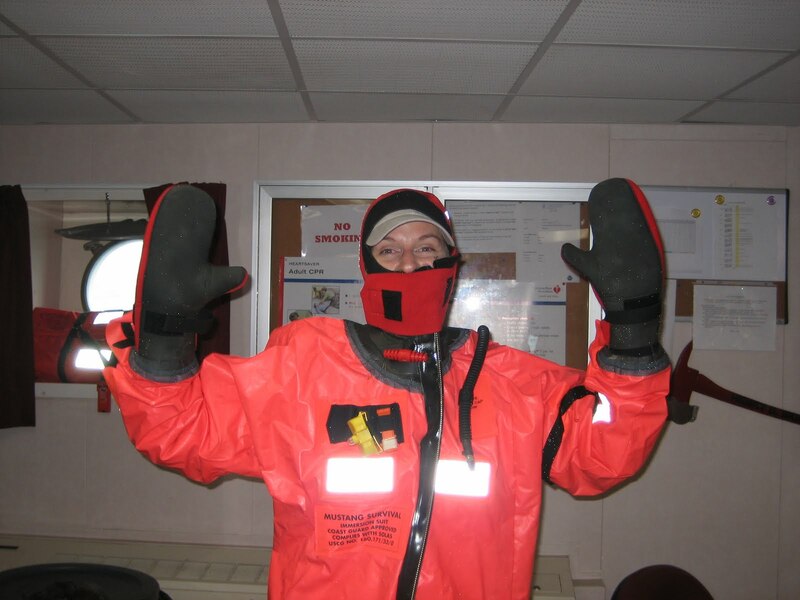 The survival suit is bright orange and is made out of neoprene. This makes the suit waterproof and very warm. The zipper and face flap are designed to keep water out, as well. Other features of the suits include reflective tape for greater visibility in the ocean, a whi8stle, a water-activated strobe light, a buddy line to attach to others, and an inflatable bladder behind the head to lift one’s head out of the water. Boots and mittens are attached so that all one has to do is jump into the suit and zip it up. It’s not that easy, however. The arm cuffs are very tight, so it takes some strength to push your hands through. It also takes strength to pull the zipper all the way up to the center of your face. All personnel aboard the ship must be able to put this suit on and abandon ship in one minute. I was able to put my suit on in the allotted time, but we didn’t have to abandon the ship during the drill. Living on a ship is an interesting experience. Space is at a premium, but the Henry B. Bigelow is actually quite comfortable. The scientists told me that this ship has a lot more amenities than some of the other research ships. 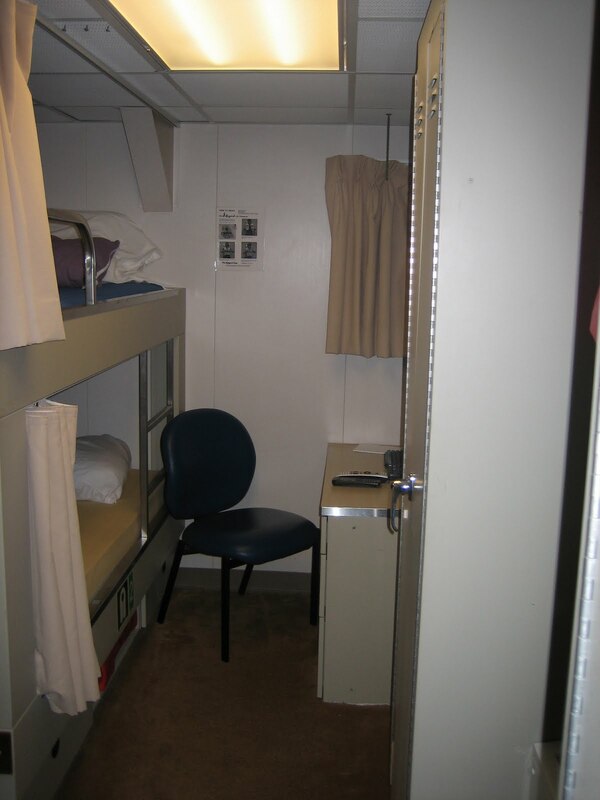 My stateroom is small and narrow, but roommates are normally working on separate watches, so no one feels cramped or without personal space. You can see in this photo that the room has two bunk beds. Mine is on top, and it has been a fun challenge trying to get in and out of bed when the ship is rocking! I haven’t fallen yet! Each bunk has a curtain that can be pulled closed to darken your sleeping area, if you are sleeping during daylight hours. There is also a desk with latched drawers, so they don’t fly open when the ship is in rough waters. Bungee cords are attached to the walls and desks to hold chairs and large items in place, too. It’s important to keep everything tied down and in the locker so it doesn’t role around and get damaged, or make noise. I learned the importance of that my first night on rough seas when hangers were banging in my locker. 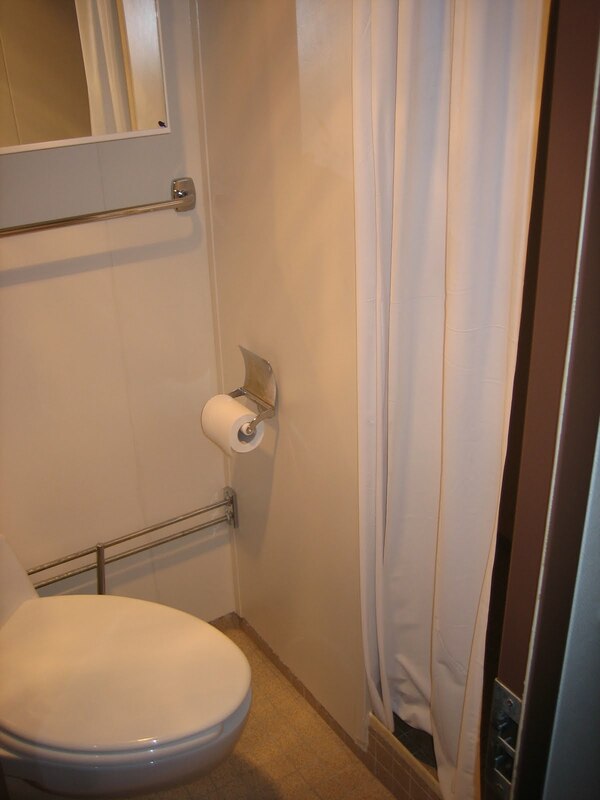 My stateroom also has its own “head” (bathroom). The term “head” comes from long ago when boats were powered by the wind. Sailors had a grated area at the front or “bow” of the boat where they could use the bathroom. It was at the front of the boat so bad odors would blow away from the rest of the ship. The figurehead was also attached at the front, so it became common practice to refer to that area as the “head.” The head in my room has a toilet that flushes, and is much nicer than the heads of days gone by, thank goodness! These are all great amenities, but the best part of my stateroom is the view! First thing every morning, I pull back the curtain to see what’s going on outside. One morning I saw several dolphins jumping out of the water as they moved swiftly toward our ship. Most days, I’ve seen fog, rain, and roiling waves, but I still enjoy looking out and seeing nothing but water as far as the eye can see, and sometimes, a beautiful sunset. Wind Dir. 143.26 º Surf. NOAA Ship Henry B. Bigelow is now docked in Newport, Rhode Island due to a deep trough of moisture from the East Pacific and Tropical Storm Nicole in the Atlantic moving up the Atlantic coast towards New England. The National Weather Service has issued a gale warning, because winds associated with this weather system are causing rougher seas, and it is too dangerous for the ship to continue trawling the ocean floor. 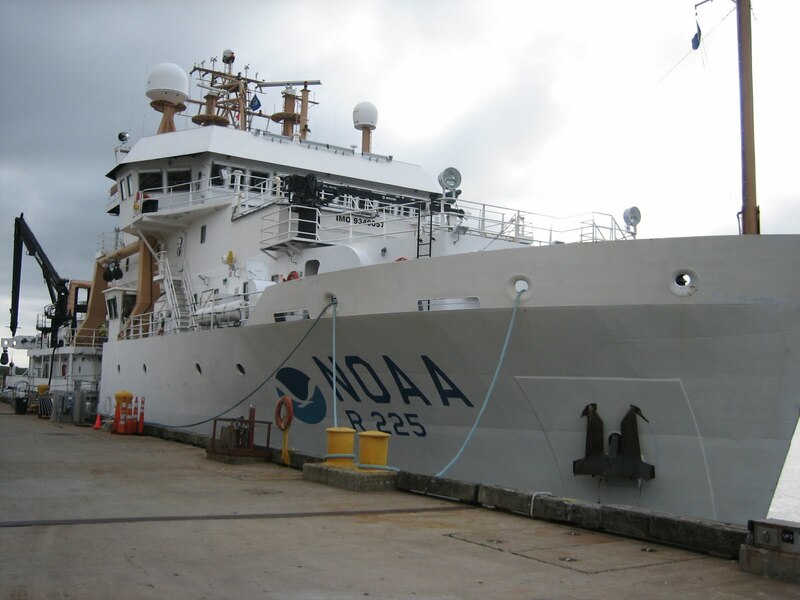 When ships are at sea conducting research, it is vitally important that NOAA monitors current weather and wave conditions to insure the safety of the crew and scientists aboard their vessels. Actually, NOAA provides current weather information for everyone in America, including commercial fishermen and all of us on land. Visit NOAA’s National Weather Service website at http://www.nws.noaa.gov/ to see what’s happening today. Our ship is equipped with instruments that collect weather and water data.Data is collected for wind speed, wind direction, water temperature, surface water salinity, air temperature, relative humidity, and barometric pressure. The information listed above under “Weather Data from the Bridge” is information gathered from the weather station located on top of the ship. Weather information is posted hourly. NOAA also has buoys placed in the waters around the United States, the Pacific and the Atlantic Oceans that collect data. Visit the National Data Buoy Center’s website at http://www.ndbc.noaa.gov/ to see where they are located and to read current data. Wind movement in the atmosphere and water movement in the ocean are interrelated. When wind blows across the surface of the ocean, friction causes water molecules to move in a circular motion. Energy built up from friction transfers from one molecule of water to the next as each molecule rotates into the next. This action causes a wave to form. The size of the wave depends on three factors; the strength of the wind gust, the distance it blows (fetch), and the length of time it gusts (duration). 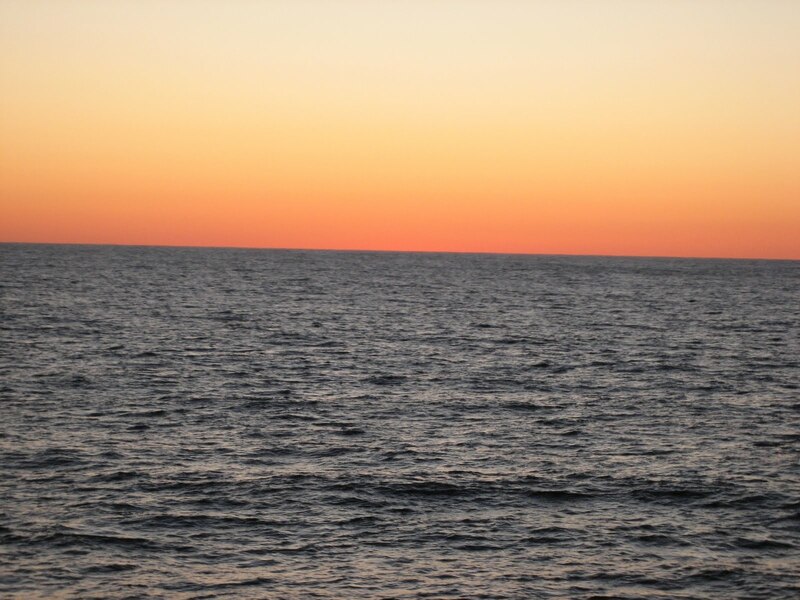 NOAA’s buoys and ships collect wave measurements over a twenty minute sampling period for wave height (WHGT), wave period (APD), and the period with the strongest wave energy (DPD). A “gale warning” is issued when wind speeds are expected to measure 39-54 mph causing waves to reach between 18-25 feet in height. So, we are here until the seas calm down, which may be Saturday. While at dock, we’ll have time to explore Newport. I’m really sad that we had to go in to port because I was just getting my sea legs and starting to feel comfortable with my work in the wet lab.But, I am glad to have a little time to wash my clothes.Everything I wear in the lab smells like fish! 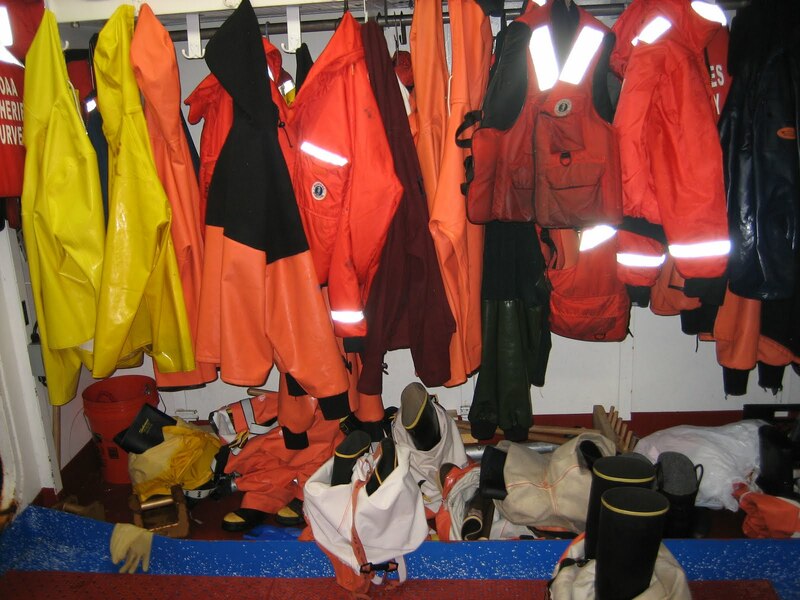 We wear our regular clothes, but put “foul weather gear” on over them before going into the wet lab. Foul weather gear consists of rubber boots, suspendered waterproof pants, and a waterproof rain jacket. Here is a picture of the gear hanging in the room where we get into our gear, and a picture of me in my pants holding a large skate. We store the pants over the boots so we can just step right in and pull the pants up, just like fire fighters. We always spray all the fish remnants off before we come back into this room to take off our gear. We also wear rubber gloves during all of our work. 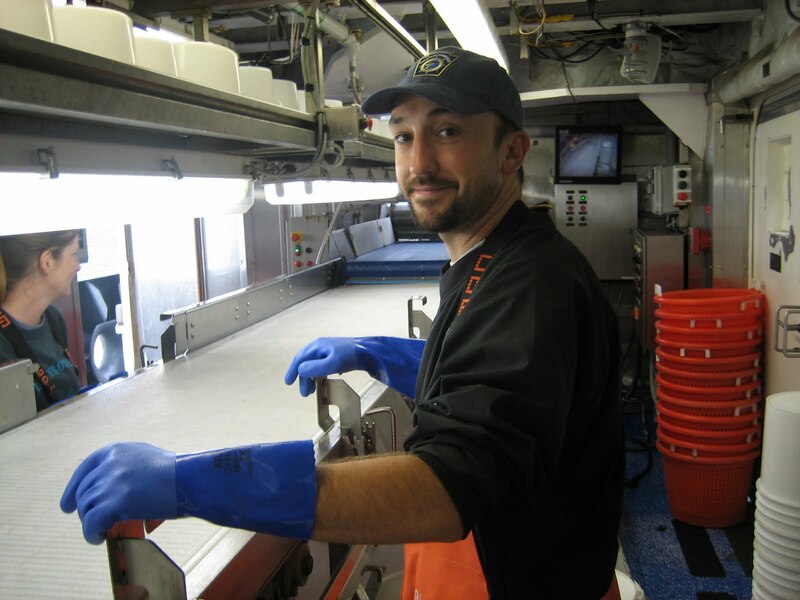 The scientists have been using the blue gloves like the ones John is wearing at right, but scientists from past cruises commented they had a hard time holding onto the fish, so we are testing two other types of gloves on this cruise. The two gloves are rubber, but one is thick like the blue gloves and one is thinner.Both gloves have ridges on all of the fingers to allow for better gripping. 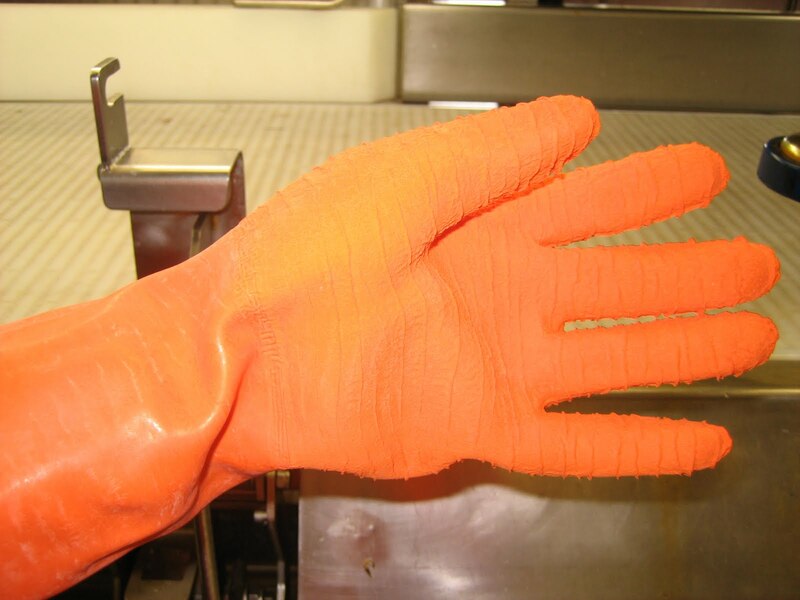 I’ve been wearing the thicker orange gloves. So far, these gloves have worked well for me. I am able to easily pick up flat fish like flounder, but the sharp point of a scup’s dorsal fin poked through my glove once. That hurt! I’m just glad I didn’t have the thinner gloves on. A lot of fish slime also collects on the ridges throughout the watch. That’s easily remedied with a quick rinse from the nearby hose. Now, I think I’ll try out the blue gloves, so I can make a valid comparison.I’ll let you know my results at the end of the cruise.